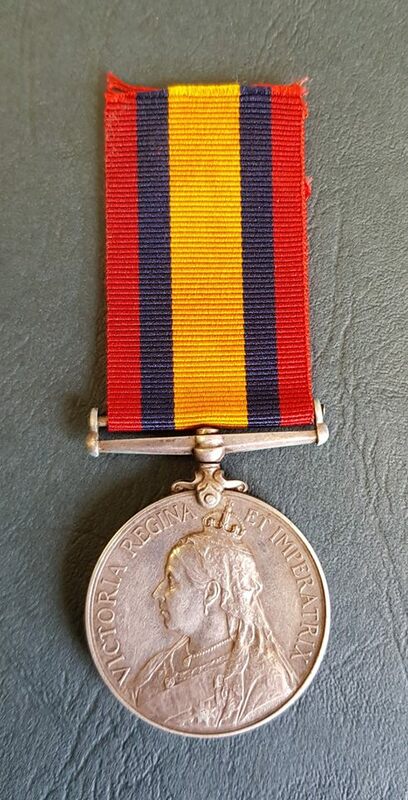 - Queens South Africa Medal to 174 C.S.Maj. E. Duberley. Sen. P. Elzbth. T.G. Edward Duberley (also variously Edward George and Edwin) was born on 13 May 1845, the son of Samuel (an Omnibus Conductor) and his wife Elizabeth Duberley. At the time of his baptism in the Parish of Paddington, Middlesex on 11 January 1846, the family lived in North Street, Marylebone. 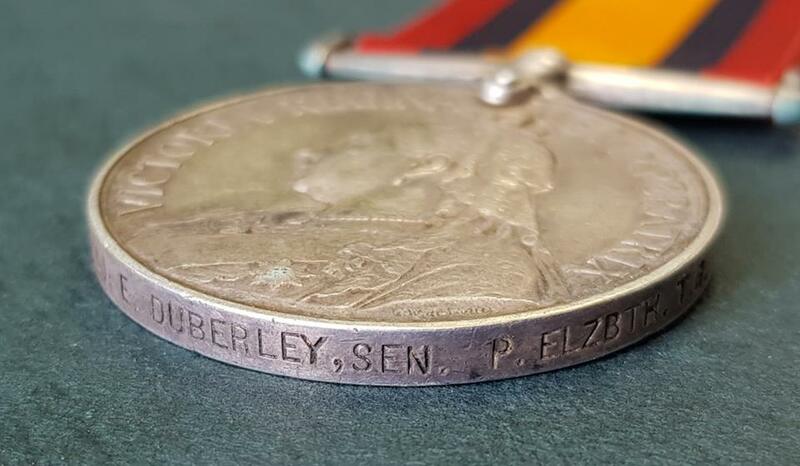 Perhaps tiring of conditions in which to raise a family in Victorian England, Mr Duberley took passage to the Eastern Cape of South Africa; arriving with his wife and three children at Algoa Bay aboard the “Zanobia” on 5 September 1850. The region in which they found themselves would have been a far cry from the hustle and bustle of London although, it has to be said, Algoa Bay (later Port Elizabeth) was already a port of some significance in the country. As he grew up Edward Duberley took up the trade of Carpenter, a highly sought after occupation in those times. According to the Methodist Church Parish records, he married an Ellen Catherine Terblanche on 2 October 1875 and went about the process of starting a family of his own. At some point he betook himself down the coast to nearby Humansdorp where, in 1883/1884 he was a Trader in the Gamtoos Valley but this venture appears not to have been commercially viable as, by 1887, he was back in Port Elizabeth plying his trade as a Carpenter. 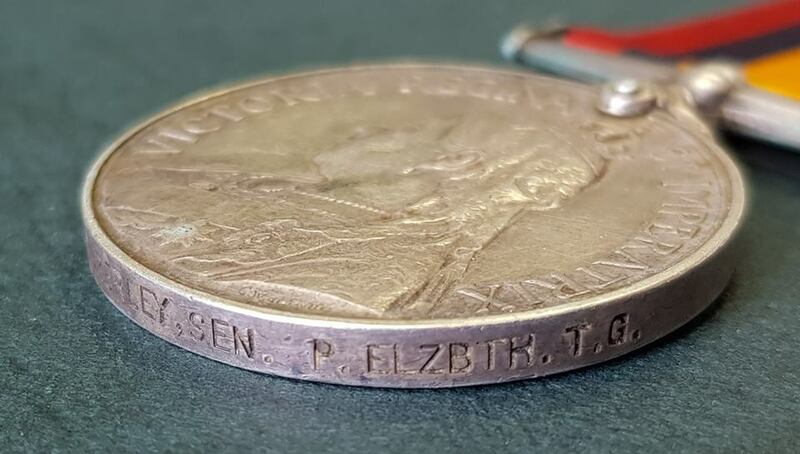 It was in that year, on 18 April according to the muster rolls of the local military regiment the Prince Alfred’s Volunteer Guard, that he enlisted for peace-time service with the rank of Colour Sergeant – this was to be the start of a long association with the military. He was still a member in 1897 not long before the Anglo Boer War, which was to shake the southern tip of Africa out of its lethargy. Commencing on 11 October 1899 this conflict between Boer and Brit was initially fought to the north of the country and, it was thought, would bypass Port Elizabeth completely. Although it is not known when plans were formulated for a defensive force in the town, Major Herbert Smith was appointed to set up a Town Guard on 17 January 1900. According to an article in the Eastern Province Herald entitled, “The Town Guard – Tonight’s Meeting” – ‘the meeting which is called for the Feather Market Hall tonight (5 February 1900) will establish on a proper basis the organisation known as the Town Guard. It is understood that 900 names have been handed in for the 800 posts, which have been created. Major Smith will explain the objects and duties of those who form the Town Guard, and those who have handed in their names will be drafted into companies listed from A to H.
The Guard was to be a purely voluntary organisation and companies would be drilled on alternate nights in the Feather Market Hall. Major Smith said that he did not expect that the occasion would arise of calling out the Town Guard but they were going to be prepared. It was the intention to give every man some rifle practice and for this purpose 100 Lee-Metfords would be at the call of the companies as they in turn performed their drill. Throughout the 1900 drills were held regularly in the Feather Market Hall but interest dwindled. After all the war was going well but was about to enter a more alarming phase – that of guerrilla warfare by roving bands of Boer Commandos. It was decided that the Town Guard should be duly sworn in on the same basis as troops on active service. On 14 January 1901 a special parade of all companies was held which was addressed by the Base Commandant, Lt. Col. Priestley. He said that he wanted still more men, in fact another Battalion, bringing the strength up to 1200 men. He called for volunteers to go out to Van Staden’s to guard the waterworks. He also stated that it was his intention to raise a Mounted Company. The volunteers to form the guard for the waterworks consisted of Capt. C.G. Elliott, Lieuts. Brewster and Lang, Sergeants Mitchley, Duberly (sic), Cowley and Harroway, Cpls. Jenkins, Evans and Naylor and 86 Privates and two buglers. On 18 January 1901 the wagon convoy taking ammunition and baggage left the Market Square with anescort of two N.C.O.’s and ten troopers. The main body of the guard were taken by rail to Uitenhage and then had to undertake a route march of 15 miles in light marching order to their camp at Van Staden’s. At the waterworks the men were divided into two groups – one to guard the pumphouse, the other proceeding to the dam. Here they stayed for four months living in tents. The so-called forts were built by the men at the dam and consisted of unmortared stone, seven feet high with loopholes and a screen wall across the entrance. On 14 April 1901 the detachment returned to Port Elizabeth. The returning troops were met at the Plantation on Cape Road by other troops and the procession marched into town. They assembled on the Donkin Reserve where the Mayor made a speech of welcome. The Town Guard continued its duties until the signing of the peace, providing guards for the concentration camps and for military, railway and harbour installations and also for armoured trains. There was only one scare when a report was received that the Boers were approaching Van Staden’s. The mounted corps was sent out only to find that the “Boers” were local farmers rounding up their cattle. He was resident at 19 Bridge Street, South End, Port Elizabeth at the time and was recorded as being a Carpenter. Tragedy had struck the family just prior to his secondment to the Town Guard. 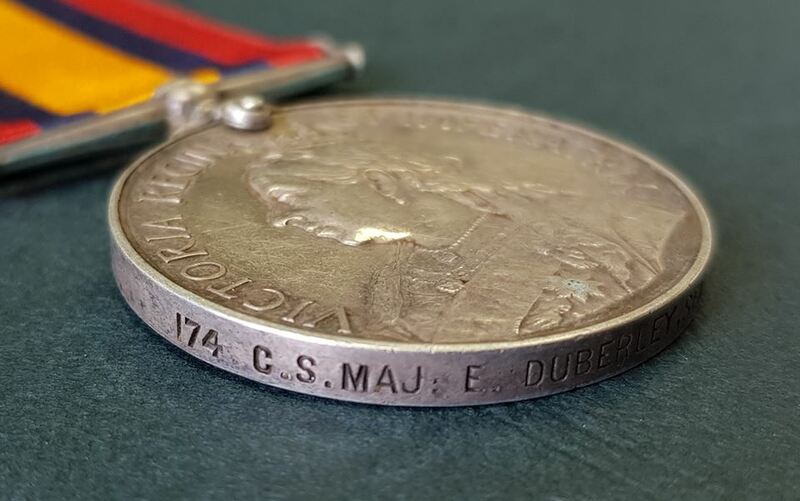 His son Stephen Frank Duberley had perished in the Siege of Mafeking on 12 May 1900 as a 21 year old Trooper with the Protectorate Regiment. The cause of death had instantaneous with a bullet through the head. Having had to endure the death of one child he was spared, by his own death, the knowledge that another, his namesake, was to die in France in October 1918. A very interesting account and nice to see 'Sen' included in the naming.